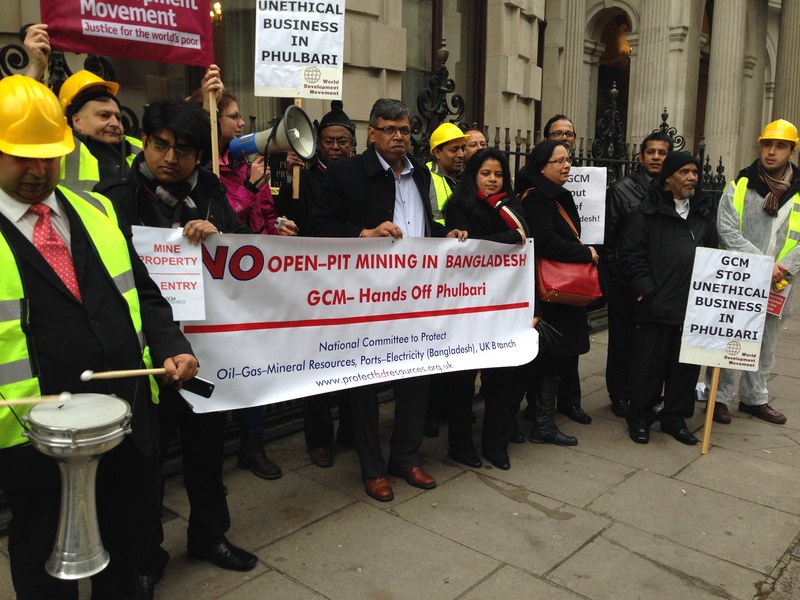 A noisy and powerful protest was held outside the AGM of London-based mining company GCM Resources, on 4 December, over the company’s proposed Phulbari coal mine in Bangladesh, which if it goes ahead will displace an estimated 130,000 people and will pose threats to the Sundarbans, one of the world’s largest remaining mangrove forests and a UNESCO World Heritage site. The British mining company GCM Resources is currently under investigation by the UK government following a complaint by the World Development Movement and the International Accountability Project. The complaint claims the mine would breach OECD rules by violating the human rights of the people who would be forcibly displaced and impoverished by the project. The project will destroy over 14,660 acres of fertile agricultural land that produce three food crops annually, threatening to increase hunger in a country in which nearly half of all people currently live below the nutrition poverty line. The project threatens to destroy the homes, lands, and water sources of as many as 220,000 people, and forcibly evict an estimated 130,000 people. The mine would violate the rights of indigenous people living in the area. The Phulbari coal project has been on hold since 2006 due to intense local and national opposition. Three people were killed and many more injured when paramilitary officers opened fire on a protest against the mine in August 2006.The project has generated grave concern at national and international levels including the United Nations and the UK government’s National Contact Point. The UK government’s investigation will evaluate whether GCM Resources has breached obligations to ensure meaningful and adequate consultation about the project, or to carry out appropriate due diligence to ensure that its project does not violate people’s human rights. The company has admitted that most of the people living in the area affected by the mine “will become landless”. Yet the company wants to move forward with its plans of forced – displacement and destruction in north – west of Bangladesh. Yesterday, the company has reassured the shareholder that it has plans to persuade the future government of Bangladesh to approve the destructive project soon after the election. Gary Lye, the company’s unwanted CEO, who had to leave Phulbari amidst protests by villagers earlier this year, told the shareholders that he is keeping contacts with government of Bangladesh through his confidential sources. But the protesters told this correspondent that GCM will never go back to Bangladesh. This company had to leave Phulbari on people’s verdict in 2006. 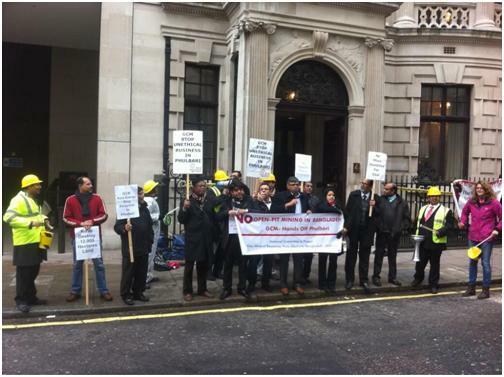 Yesterday’s protest was held by members of the UK Committee to Protect Oil, Gas, Mineral Resources, Port and Power in Bangladesh, the Phulbari Solidarity Group, the World Development Movement and the London Mining Network and other Bangladeshi activist groups. Call out for Action against GCM Resources plc. GCM Resources plc, an AIM-listed UK-based multinational company, supported by major hedge funds and banks including UBS, Credit Suisse, LR Global, and Argos Greater Europe Fund, wants to implement a massive open-pit coal mine in Phulbari in the north-west of Bangladesh, displacing up to 130,000 people and threatening lives. If implemented, the project will destroy over 14,660 acres of fertile agricultural land that produce three food crops annually, threatening to increase hunger in a country in which nearly half of all people currently live below the nutrition poverty line. The project threatens to destroy the homes, lands, and water sources of as many as 220,000 people, and forcibly evict an estimated 130,000 people. On 26 August 2006, three people were killed and over 200 injured when paramilitary troops fired on a massive protest of some 80,000 demonstrators in Phulbari. The protesters were opposing the proposed open pit coal mine that the Bangladesh subsidiary of GCM Resources plc, Asia Energy, intends to implement. The situation in Phulbari has been tense and volatile since. The potential for violence has remained high in this project ever since August 2006. The project has generated grave concern at national and international levels including the United Nations. This year the GCM Resources was dealt a serious blow as the Organisation for Economic Cooperation and Development (OECD) agreed to consider complaints regarding severe human rights violations associated with the company’s planned coal mine in Bangladesh. Yet, GCM is aggressively moving on to implement this immense open pit coal mine ignoring the human rights and environmental degradation the project would leave. 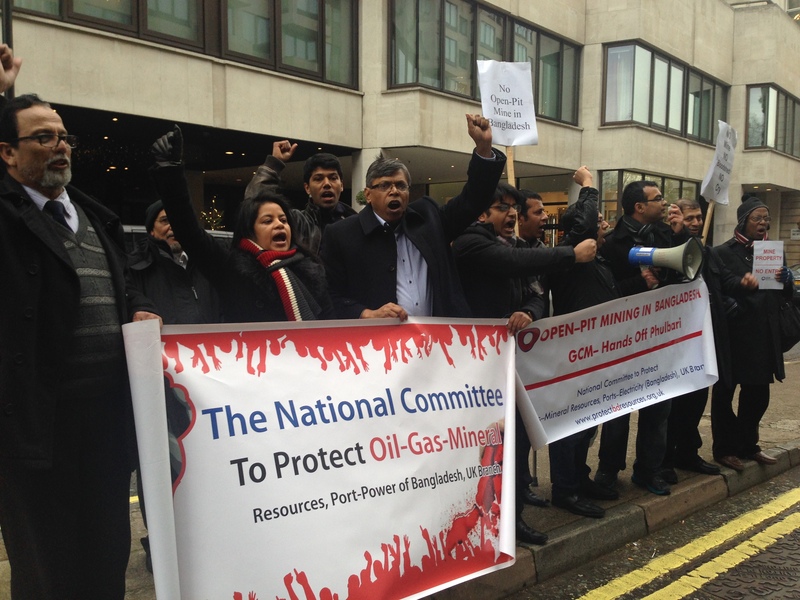 The UK branch of National Committee to Protect Oil-Gas-Mineral Resources and Port-Power of Bangladesh is campaigning in solidarity with the people of Phulbari to throw GCM Resources/Asia Energy out of Bangladesh. 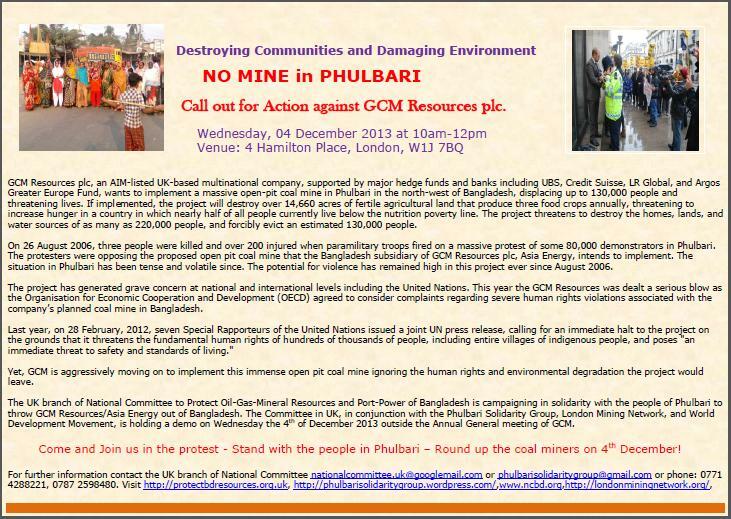 The Committee in UK, in conjunction with the Phulbari Solidarity Group, London Mining Network, and World Development Movement, is holding a demo on Wednesday the 4th of December 2013 outside the Annual General meeting of GCM. Come and Join us in the protest – Stand with the people in Phulbari – Round up the coal miners on 4th December! For further information contact the UK branch of National Committee nationalcommittee.uk@googlemail.com or phulbarisolidaritygroup@gmail.com. Some of you might have seen a ‘News Report’ in Prothom Alo (Bengali Daily) and a few English newspapers on increase of support for GCM’s project in Phulbari area. The local leaders have sent a press release (Translated by me) that protests against the one-sided story. This is part of the propaganda machine unleashed to get some gain amidst the heightened political crisis in Bangladesh. One of the local UP Chairman who is mentioned in the news to be supporting GCM’s claims has contacted the National Committee and expressed his surprise as he was never contacted about the content of the ‘news’. Attached is the translation. This is also a very crucial time on the eve of their AGM. They will try to rip some gains from this news in the AGM too. It has come to our notice that a fraudulent news titled “Phulbari Coal Mine Development: GCM demands positive results from their new strategy” has been published in the Daily Prothom Alo on 24th November. It is to be noted that the name of the reporter is kept secret and they have used ‘Special Correspondent’ in the writer’s line. The way this news report ignores all other views without even checking the facts and presents the view of one side (which in most part is false), it seems that whoever wrote s/he must be one of the paid special correspondents of GCM. Asia Energy, that is GCM, published a press release on the 31 October. In the release they claimed, “There has been a notable increase in the engagement of the company with the people of the mine footprint. Public support for the mining project is gradually increasing.” It is to be noted here that GCM has been thrown out of the Phulbari region in the 2006. Since then they have been making these sort of false claims to keep their share price in the London Stock Exchange afloat. It is surprising that just because GCM claimed it, a leading daily like the Prothom Alo has treated it to have news value. How can it be news, when a month has already passed since the press release? What is also very surprising is, in this ‘news’, the information and facts has not been checked, even people’s representatives or protestors against the Phulbari coal project has not been consulted. They just treated one –side’s claim as news. We see no way of justifying this as journalism! This ‘news’, claimed that Dinajpur South East Development Front had already collected 50 thousand signature from local people which is allegedly supported by the Chairmen of Birampur, Parbatipur and Nawabganj in their press statement. However, the ‘special correspondent’ did not bother to contact the chairman of Phulbari sub-district where two-third of the mine lies. Moreover, it is because of the resistance from the people of Phulbari that the mine is still being halted. The truth is: due to the presence of the popular opposition in Phulabri the AEC cannot even show their presence there, let alone go and gather signatures. The Dinajpur South-Eastern Development Front have done some signature collection which however, is not about Phulbari mine instead about the upgrading of Birampur into a district. Therefore, the signatures do not have anything to do with the Phulbari mine. Moreover, a daily as esteemed as Prothom Alo should not be publishing stories without proper research and acknowledgement from all sides. We hereby, protest against such journalism where fraudulent facts become concocted into ‘news’. We expect that Prothom Alo will publish rejoinder after researching on the topic more and incorporating views from the local people.